Tommy Miller might have one eye on a coaching career, but the 36-year-old isn’t ready to hang up his boots just yet. The former Sunderland and Ipswich midfielder is a coach with the under 14s at Middlesbrough’s academy, but joined Halifax on a short-term contract two weeks ago. Miller has played in all five top divisions of English football and fits the bill perfectly for Town boss Darren Kelly, who was keen to add more experience to his squad. Miller feels the move to Halifax was an ideal opportunity to prolong his playing days and allow him to continue with his burgeoning coaching career. “I do want to get into management eventually,” he said. “I’m still learning but I’ve got my badges and I’m currently moving on to the A-Licence. “But at the moment I want to play, I was missing playing. “I’ve been given the opportunity to play here for a month so we’ll see how it goes. “I’d always held out hope that something would come up. “Something in India might have come off, there were a couple of offers in Scotland, but I didn’t want to be travelling too much. Miller’s last game before his Town debut at home to Guiseley last Saturday was as a substitute for Hartlepool against Exeter in April. “I hadn’t kicked a ball for five months prior to that so I’m going to be a bit rusty and I was tired in the last 20, 25 minutes (last Saturday),” he said. “But it was good to get that first 90 minutes under my belt and hopefully I’ll only get fitter and stronger. Before that, Miller’s previous outing was in Hartlepool’s 2-1 defeat at Cambridge in October last year, after which came an enforced absence of six months from first-team football. “I trained on the Monday (after Cambridge) and tore my calf, them I was out for four months. “Then I tried to come back too soon and kept re-tearing it, then I ended up going to London to see a specialist who got to the root of the problem and fixed it. “I played four or five reserve games, got my fitness back and then I was involved towards the end and came on for my 600th game at home. “I would’ve loved to have stayed there. It’s my club, it’s where I started. “Being player-coach would have been perfect but it wasn’t to be. “I ended up leaving there, doing bits and bobs but I’ve still been watching games and going to games and missing playing. The former Huddersfield man was named as captain on his debut last weekend, and is more than happy to take the armband. “It was a bit of a surprise, “ he admitted. “Darren pulled me to one side after training last week and asked me if I’d be captain and I said it would be an absolute pleasure to do it. “I think he sees that I’ve got the experience, I’ve played a lot of games, played in every league and he wants me to be a leading figure on that field, be a talker, which I am. “I’m happy to be captain. “I think game management is important. I can help us see games out, maybe where in the past the team has crumbled and once a goal has gone in, they’ve conceded two, and three or what have you. 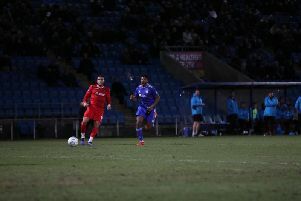 Miller is confident Town can haul themselves up the table, and isn’t ruling out extending his stay, which expires after Town’s home game with Braintree next month. He added: “I haven’t played for five months so I understand why they’ve done that (given him a short-team deal), and from my point of view it suits me perfectly as well.